Harris Poll Interactive conducted a recent poll in November in which they sampled 2,455 American adults and asked a variety of questions regarding the their beliefs, mostly religious, though they did poll with questions about UFOs, ghosts, reincarnation, and the like. The tables of some of their results can be found at Harris Poll Interactive, but I’ve put some of these results in graphic format should anyone wish to use them. If you do, I only ask that you include a link back to Breaking Spells. I can’t help but wonder how many people answer polls like this based on what they want others to think about them rather than what they really believe. I’ve always had a hard time accepting that people truly believe in virgin birth and miracles to the degree represented above. Surely there’s more hope that miracles exist and that Jesus was born of a virgin than actually fully believe it. 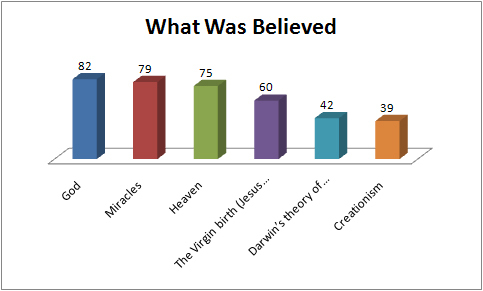 But its interesting to see that evolution edged out ahead of creationism, particularly given some of the other responses about miracles, and the “word of God” (below). What? The Book of Mormon isn’t strongly held to be the “word” of God? 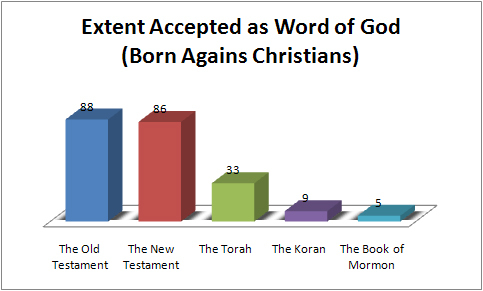 And what’s the deal with the Old Testament slightly beating the New Testament? This is a bit telling if you ask me: Christians are slightly more willing to accept that OT is the “word” of God over the NT -and it’s in the OT that some of the best hatred and bigotry can be justified. And it’s also interesting to note that the “not at all religious” and “not very religious” categories together out-weigh the “very religious” category. Anyway, these types of polls are often difficult to accept since even the methodology section of the Harris Interactive site doesn’t reveal enough details to know how effective the pollsters were at delivering the questions or what most of the actual questions were (or their contexts). Even the tone of voice carried by the pollster can influence the answer. I’ll still add these graphs to the Data page along with a citation and link. 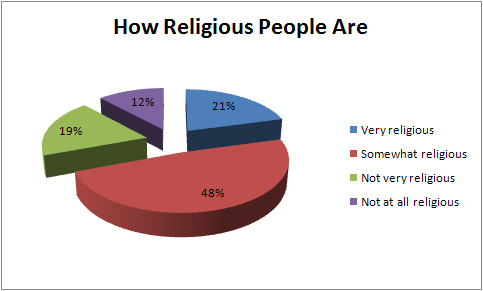 This entry was posted in humanism, Scientific Study of Religion and tagged belief, harris poll, polls, religion. Bookmark the permalink. Funny, isn’t the torah contained in the old testament? Are these the results anti-semitism or ignorance? “Torah” specifically refers to the Pentateuch, or the first five books of the Hebrew bible (the Tenakh): Genesis, Exodus, Leviticus, Numbers, and Deuteronomy. The Torah stops at these five books, whereas the Christian bible includes additional OT texts as part of its canon. I believe that whether it be the old testement or the new it is all the word of God and should be respected and practiced in your day-to-day life as well as throughout your life. After all look around you at this awsome creation that we call home that we are destroying on a daily basis. If he can paint a canvas that looks like this who am I to argue. I suspect that the OT beat the NT because Jews accept the OT and not the NT. I don’t know the percentage of USians who are Mormon, but Mormons tend to occur in geographic pockets, and the numbers probably reflect this fact. I suspect that even those who admit to not being very religious, which probably translates as not attending church very often, would be loath to say that they do not believe in God. Many people have a wishy-washy acceptance of whatever story is widely publicized. However, these people probably brought down the creationism numbers because many people view creationism as Ham-style young earth idiocy. You are quite correct that the wording of questions and research methodology is very important in interpreting results. I believe that whether it be the old testement or the new it is all the word of God and should be respected and practiced in your day-to-day life as well as throughout your life. What about the Koran? Or the Hindu Vedic texts? Are these, too, the words of God? If so, why then are there so many contradictions between them with regard to religious dogma and what it means to meet God’s expectations? If not, why do these texts find themselves *not* the word of God and yours does? I suggest that if it is the case that you don’t consider the sacred texts of other religions to also be the word of God, then it is because you are raised to accept the dogma of your culture and not theirs. This, however, doesn’t imply that you’ve found the correct god or that a god is necessary. After all look around you at this awsome creation that we call home that we are destroying on a daily basis. If he can paint a canvas that looks like this who am I to argue. I don’t see a “creation.” I see reality. Nature. It is, indeed, awesome and marvelous. But not created with any purpose or design that is supported by evidence. I feel sorry for those that can’t marvel at the awe and wonder of the universe without first applying a supernatural cause -that just cheapens and minimizes that awe and wonder. I donâ€™t know the percentage of USians who are Mormon, but Mormons tend to occur in geographic pockets, and the numbers probably reflect this fact. An astute point that I’m ashamed I didn’t notice earlier. The same goes for the OT/NT observation.